We stand tall amongst our peers by continuously investing in our manufacturing operations, as we believe that industry plays a significant role in the success of the United States economy. We believe that American companies should work hand in hand to build better products. That's why we make it a priority to partner with domestic suppliers for the high quality materials we need. We are committed to quality throughout our entire manufacturing process. Our responsibility is to provide you with the best performance possible, a promise we deliver on with each and every product that leaves our facility. We aim to be the leading innovator in our industry by applying our resources and talents to solving customer application challenges. In doing so, we maintain integrity by actively controlling and reducing our carbon footprint in the environment from which we operate. Conduct all activities with the utmost integrity and honesty. Maintain a commitment to manufacturing within the United States. Respect the environment by actively controlling our environmental footprint. Infuse a discipline for quality in every process we perform. Cultivate a welcoming and progressive work culture for our employee family. Pursue innovation in every single aspect of our business. We treat our customers, suppliers, and employees as family. We rely on each other to provide the Greatest Customer Service Humanly Possible and conduct our business accordingly. You can count on us to deliver the utmost quality from not only our products, but our employees as well. 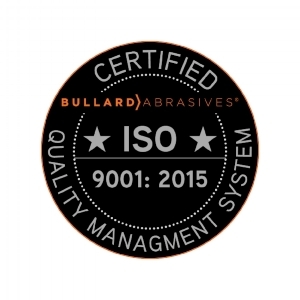 In 2009 we were proud to receive certification of our Bullard Abrasives manufacturing system to the international ISO 9001: 2008 quality standard. Our current ISO 9001: 2015 certification assures customers and employees that we produce the most consistent and highest quality product by adhering to a rigorous quality management system. Our employees are continually trained on our processes, quality policies and procedures; they are experts at manufacturing our products to the highest standards. Our products are designed to work hard so you don't have to. But our attention to detail and commitment to innovation doesn't stop with our products, it dictates the manner in which we do business with you. We have a passion for technology but understand that innovation is nothing without customer benefit. Our efforts translate into competitive advantages for you and your growing business.